Ammonia and ammonium ions build up as a result of the bacterial decay of urea and proteins, ie, there are too many fish in the aquarium or the fish are being fed more than they need for healthy survival. But, in an aquarium kept in balance nitrogen-fixing bacteria oxidize the ammonia, changing it from nitrite to nitrate and so rendering it largely harmless. Nitrites are the salts of nitrous acids; Nitrites are the killers of aquarium fish and what we must guard against in the Nitrogen Cycle. They occur in the aquarium either through the partial oxidation of ammonium compounds (Ammonia) or through the reduction of nitrates. Unlike nitrate compounds (with the exception of ammonia), nitrites are poisonous even in very weak concentrations, which is why they are dreaded by the aquarist. The danger of nitrite formation occurs especially with too low a redox potential, ie in aquariums where too much oxygen is used up as a result of overpopulation and decaying processes (due to dead fish and snails left in the tank or dying plants and leftover food decaying on the bottom of the tank). The simplest way to prevent nitrite build-up is to feed sparingly, make sure there are not too many animals in the one tank. Secondly, regularly carry out a partial water change, not exceeding 20% of the total volume and with well-aged water, not tap water. Third, make sure there are not too many total living animals in the aquarium. Many new to the aquarium hobby forget that even though catfish, algae eaters, and snails are “cleaner fish” each still produces waste and adds to nitrate pollution. Nitrates are the salts of nitric acid and the end-product from the oxidation of nitrogen compounds. In the aquarium, Nitrates are produced mainly through the breakdown of animal protein and ammonium compounds (urine, excreta, foodstuff and the remains of fish, snails, and plant leaves). Most freshwater Tropical fish and aquarium inhabitants are very tolerant of even large quantities of Nitrates. However, precautionary measures against too high a build-up of nitrates include feeding sparingly and only having a small animal population which is adjustable to the total size of the aquarium. Aquatic plants can greatly reduce the levels of nitrate in a well-adjusted aquarium as well. Occasionally the level of Nitrates in the water may be lowered by partial water changes, but never directly from the tap water. Water must be sufficiently aged and changed in small amounts over time. Large changes in the nitrate levels of the aquarium water can actually do more harm to fish than high levels of nitrate. Briefly, the Nitrogen Cycle is a biological process that involves the continual circulation of nitrogenous compounds such as ammonia, nitrite, and nitrate to process wastes in the natural water. In a closed aquarium, this cycle must be established in what is commonly called the Nitrogen Cycle. This cycle is established over time, it usually takes up to 3 months before a new aquarium is fully cycled, but there are certain tricks Dr. Reich has developed over the years that can considerably reduce that time. 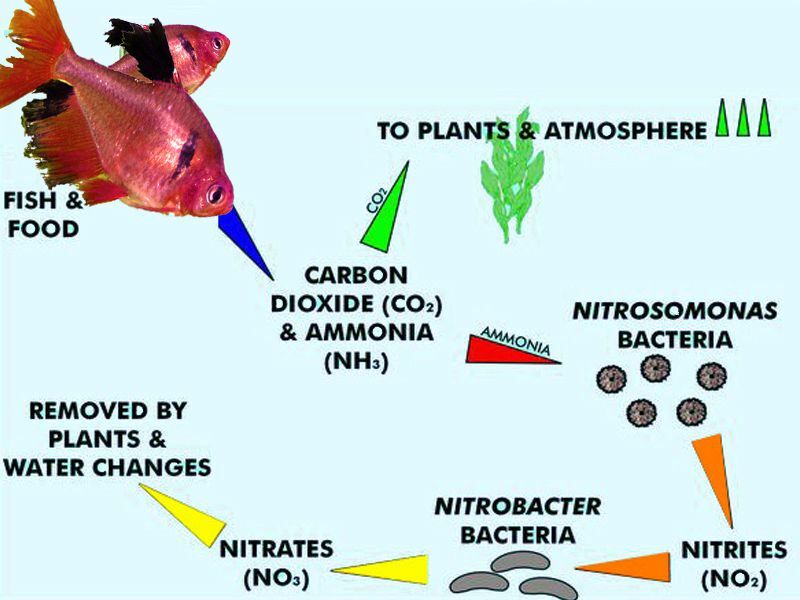 Ammonia, nitrite, and nitrate are the main biological toxins found in the aquarium, so it is important that the nitrogen cycle works effectively to remove these pollutants. The reason we recommend stocking your new aquarium slowly over time and with younger smaller fish is to allow the nitrogen cycle to develop and keep pace with the gradual increase of waste matter. It is natural to want to fill a new aquarium with the largest prettiest fish you can find and feed them all they seem to want to eat. However, without the good bacteria which builds up in an aquarium over time, in other words until the aquarium has cycled, the likelihood is many of your new fish will die. Once more if you do not remove the dead fish quickly, their decay will cause an even more toxic situation and you will lose the rest of the fish. Please pay attention, cycle your aquarium, add fish gradually and feed sparingly. If you give your aquarium time to “cycle” you will have a happy healthy aquarium long into the future.